WARSAW — A student walking along this city’s “Royal Way’’ suddenly stops, then mock marches to a polonaise soaring in the mild spring air. Nearby, two women sway their arms like ballerinas to a lyrical waltz while toddlers dance. Their inspiration? 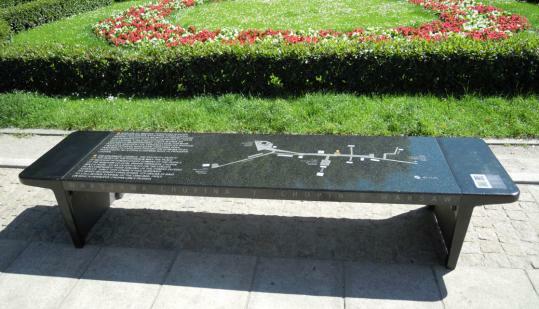 Fifteen black stone benches recently installed throughout Warsaw’s historic center that, with a touch of a button, play Frédéric Chopin’s greatest hits. Situated where events in the composer’s life occurred, like his first public performance at the Presidential Palace at age 8, they offer brief explanations of the site’s importance and a route map. The benches are part of festivities underway around the globe to commemorate the 200th anniversary of the birth of Poland’s favorite son (1810-49). But the party is most exuberant in Warsaw, close to the town of Zelazowa Wola where he was born. At 20 he left (a bench sits outside the post office that shipped his bags to Paris), never to return home. In a year filled with tragedy, the sound of Chopin’s music in the streets is uplifting. “We are still a bit in shock,’’ a young woman says about the April plane crash that killed Poland’s president and political and military leadership in Smolensk, Russia. Severe floods followed in May. Poles suffered greatly under foreign rule during Chopin’s lifetime. A failed rebellion against the Russian czar devastated the populace. Though Chopin lived half his life abroad, perhaps no artist better understood the Polish soul, translating its hopes and despair into melodies tragic, or tender, or heroic. Chopin might still recognize the old town’s streets, painstakingly restored after the Nazis destroyed 85 percent of the center in 1944. Not everyone here waltzes with joy. An art professor shrugs and says, “Is good for those affected . . . by this kind of magic.’’ Which, during my recent visit, seemed to include the entire city. If half a minute is not enough magic, visitors with cellphones can access an electronic chip on the bench to download longer samples and more Chopin factoids. There are also free Sunday afternoon piano recitals (continuing through September) offered in Lazienki Park. More concerts, competitions, and exhibits related to the composer’s life jam Warsaw’s busy cultural calendar through the end of the year. In addition, the newly renovated, high-tech Chopin museum reopened in March and is hugely popular (reserve tickets online). Visitors inspired to play a sonata or nocturne afterward can indulge themselves at the Chopin 2010 Office near the Presidential Palace. Though the composer found fame and love abroad (he was buried in Père-Lachaise cemetery in Paris after succumbing to tuberculosis at 39), he literally left his heart in Warsaw, inside a pillar in the Basilica of the Holy Cross. A bench marks the spot. Mary Ellen Monahan can be reached at maremonahan@gmail.com. Doubles from $125 per night. Convenient to the train station, the sleek Novotel has great weekend rates (doubles from under $100), and fantastic city views. Romantic hotel in the historic center. Doubles from $110. Excellent Mediterranean food and even better people watching from the busy terrace. Appetizers/, entrees $6-$22. One of Warsaw’s best with a romantic country setting and traditional dishes, $7-$22. Excellent spot near the Royal Castle for reviving with a latte or aperitif. Need more Chopin? A pianist plays classics on the terrace evenings, weekends.